The weather hasn’t been too cooperative this spring with regards to my Forest Service bird point count. First weekend in May was cold and rainy, it rained half of the next weekend and after getting some points in Saturday, last Sunday (5/21) was looking bleak again. I decided after studying various weather reports and maps that there might be a window of opportunity for a few hours over on the Grandfather District near Morganton. I struck out about 5 a.m. Sunday morning and drove most of the way over in a pouring rain. I stopped for gas in Morganton and could see a little light in the sky – the rain had slowed to a sprinkle so I was feeling better. But by the time I got to my first point a light rain was falling steadily again. I pulled into the woods, rolled by fleece up for a pillow, set my phone alarm for 7:15 a.m. and settled in for a power nap. It was looking a little brighter when the alarm went off but there was still a light rain. I was sitting there contemplating my decision when I realized I was hearing more than a light patter of rain outside. I cracked the window a little bit to listen and realized I wasn’t the only one awakening. There was a loud hooded warbler right outside my truck and a couple of noisy red-eyed vireos, but there was also a building roar in the woods – cicadas! 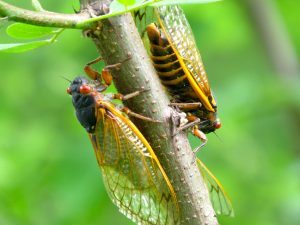 I knew that Brood VI, one of the 17-year broods of periodic cicadas had been emerging in Burke and surrounding counties, but I didn’t know exactly where. I had shared part of my 2008 point survey with Brood XIV and other than, at times, being almost impossible to hear it was quite a trip. Looks like I might have company again this year. The adult 17-year-old cicada is one of, if not, the longest-lived insects in North America. All but about a month or so of that life is spent as a nymph about a foot or so underground attached to a nice succulent tree root. No one knows how the nymph counts the years, but after 17 it withdraws from the tree root and makes its way to the big dance. It spends four to six weeks as an adult, to reproduce and die. The male usually keels over just after mating. The female lives to deposit her 400 to 600 eggs. The eggs hatch in six to eight weeks and the nymphs fall to the ground, burrow down, find a root and wait 17 years for their chance in the sun. There are 15 broods of 13 and/or 17 –year cicadas. They are composed of one genus, Magicicada with seven species. Brood VI contains two species M. septendecim and M. septendecula. Brood XIV contains these two species plus M. cassini. After browsing this wonderful website http://www.cicadamania.com/ I’m fairly certain that the Brood VI bugs I encountered last Sunday were M. septendecim. Thinking about the life cycle of these bugs makes me grateful for the public lands we have across this country. The vagaries of land use across the country can be real stumbling blocks for critters that only have one shot at procreating every 13 or 17 years. Forests preserved in perpetuity mean that whoever is surveying birds for the Forest Service on the Grandfather District in 2102 will get to share the forest with Brood VI.